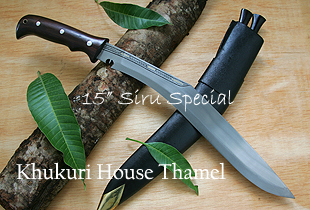 Nepalese popular Sirupate Khukuri 15" blade now has Full Flat Tang blade and also a New Handle for better handling and gripping. 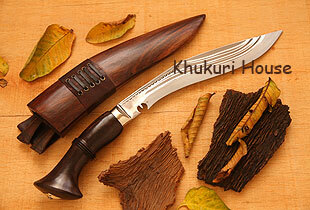 Yet another new Khukuri blade from the stable of Khukuri House Thamel. This unique new knife has a slight modification to the shape and a differently crafted handle, all this to make this blade a Supreme Jungle knife. Welcome to Khukuri House Thamel. We are proud to present the Legendary Kukris. 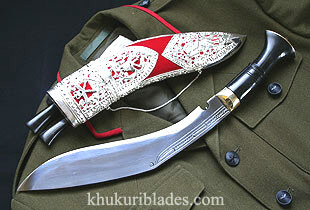 kukri a medium-lenght curved knife each gurkha soldier carries with him in uniform and in battle. In his grip, it is a formidable razor sharp weapon and a cutting tool. In fact, it is an extension of his arm. When his rifle misfires, or when his bullets have run out, a gurkha unsheathes his kukri and makes his final " do or die " run on the enemy in a fury to finish the business. 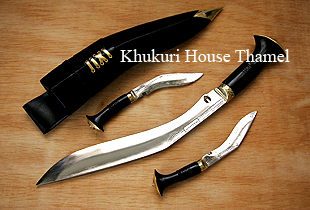 Khukuri House Thamel is the manufacturer and distributor of the finest Kukris in Nepal. Established by Mr. lalit Lama, an ex-British Gurkha Warrant Officer in 1993 is the first genuine Gurkha Knife store in the heart of thamel (tourist area) in Katmandu, Nepal. Khukuri House would like to share this wonderful news and is very proud to be a part of this wonderful event. 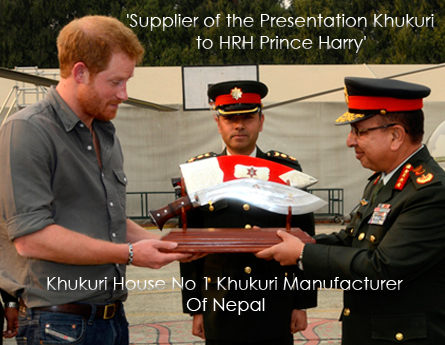 Prince Henry of Wales "Harry" on his on going official visit to Kathmandu, Nepal, was presented a Beautiful Khukuri Blade, text engraved honoring Harry by the Nepal Army. 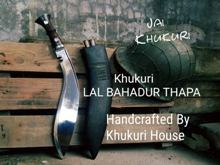 This Majestic Khukuri was made by Khukuri House. What an awesome honour for this house. 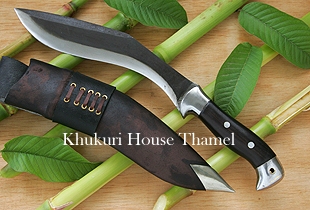 Kukri, Khukuri, khukri, kukuri, kookuri, no matter how you call it; it always refers this curved sharp metal carried by Gurkhas; the most feared weapon of all.